Our culture says that the most important things for children are education, good health, treats, entertainment, and material things. Yet as Christians, we know that children's spiritual health is the most important thing. So we need to pray for them, but where do we start? This little guide is both deep and do-able. Melissa Kruger takes us back to the Bible to show us what God’s will for children is, so we can pray in line with it. She selects 21 key areas of spiritual growth and character development. For each one, there are five short prayer prompts drawn straight from the Bible. When we pray in line with God's priorities as found in his word, our prayers are powerful and effective (James 5 v 16)—and that's a truly thrilling prospect. This book can be used in any number of ways: work through it as part of your daily quiet time, or pick it up whenever a particular need arises. Either way, it's worth stepping out of the busyness of daily life for five minutes to pray meaningfully for your child, grandchild, godchild, or kids in your church—from tots to teens, and every age in between. In an age of helicopter parenting, it's easy for parents to think that our children's future rests in our hands. Even as Christians, we spend more time trying to manage the world around them than crying out to the God who holds the world—and our children—in his. But with 5 Things to Pray for Your Kids, Melissa Kruger gives us the practical steps we need to take all we can't control to the One whose goodness reigns supreme. Because in the end, the very best thing parents can do with our hands is fold them... in prayer. I can easily fall into a rut when praying for my children. 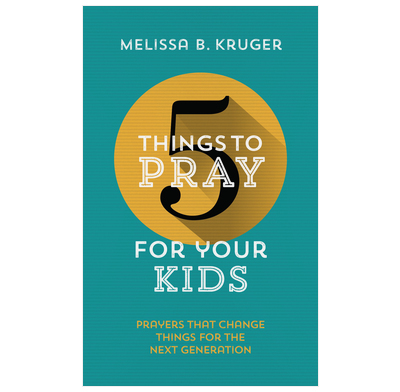 I am so thankful, therefore, for Melissa Kruger's fresh new book, 5 Things to Pray for Your Kids: Prayers that Change Things for the Next Generation. This is not an abstract lecture about prayer; it's a practical guide to prayer. The layout is clear, the framing is biblical, the prayer prompts are brief, and the value—for us, for our kids, and for the glory of Christ—is eternal. This book is a gift to the church, specifically parents who desire to pray over their children frequently. Before, we prayed the same prayer over our son, but this guide has helped us pray for more aspects of our son's life.As a new parents, my wife and I so grateful Melissa took time to write 5 Things to Pray for Your Kids.